Just got a second AI Prime to run over my tank. This will get rid of the shadowing on the sides. I am super excited about this extra light. I am looking into what skimmer to get for the tank, It is between the ghost skimmer and the eshopps nano skimmer. anyone on here have any opinions about this? The tank is in my room so i would like the skimmer to be a quiet as possible. For sure, I am driving to Indianapolis today. I'll try to post some tonight! There is a current FTS, things are pretty much completely different from the last time I posted a FTS. Back in January, maintenance was at an all time low and nitrates were at an all time high. I got an RO/DI system and maintenance is now at an all time high. The tank has been running strong since Jan 13th. Please correct me if I am wrong, this was labeled as a "Wellso"? at a frag swap. 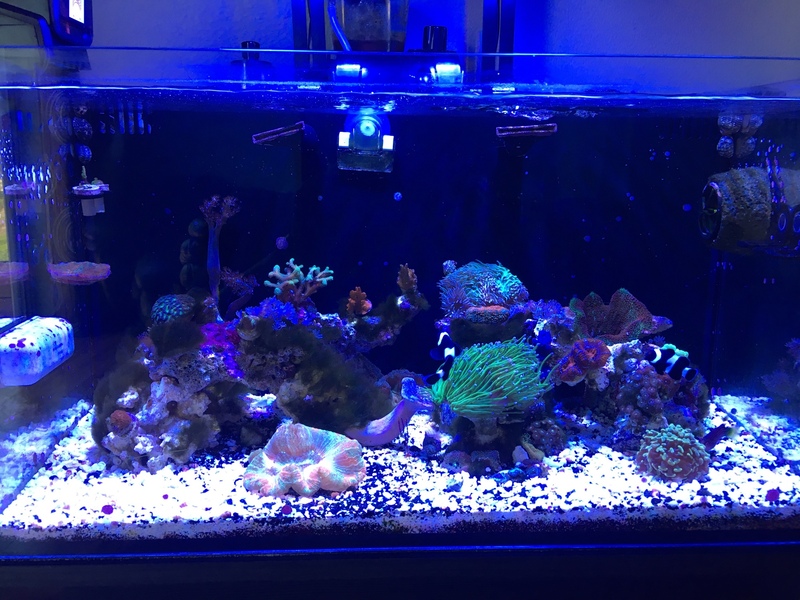 I think Rainbow Trach is the right name for the coral. I am currently running an AI prime over my tank. I just bought a second one to get rid of the shadowing. I got a MP10wQD as well. Right now the HOB equipment you see is a aqua C remora that will soon be taken down and replaced with a ghost skimmer or a eshopps skimmer. 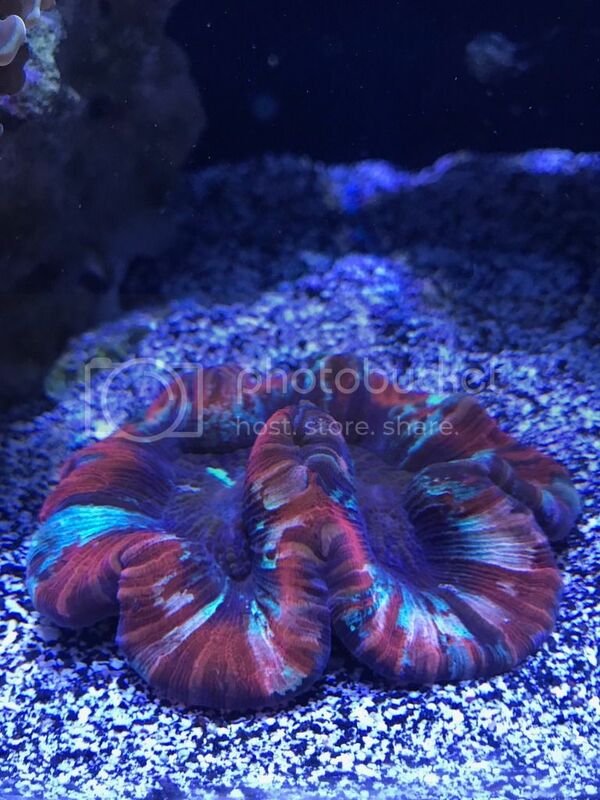 Here are two of my fav corals. 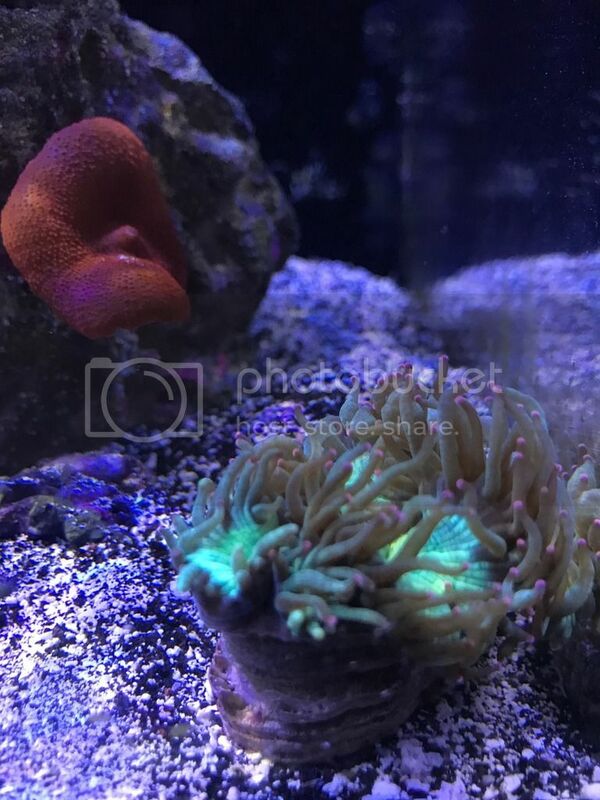 Aussie golden hammer and an Aussie Pink tipped elegance coral. 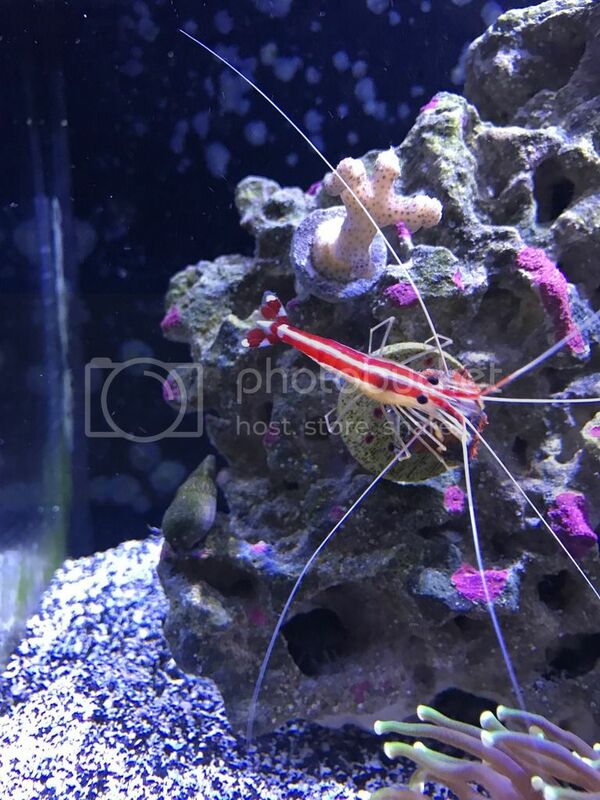 For all of those that have been following along, I have had this cleaner shrimp since the start and he grown so much. He probably molts once every other week. Don't mind the dead stylophora. 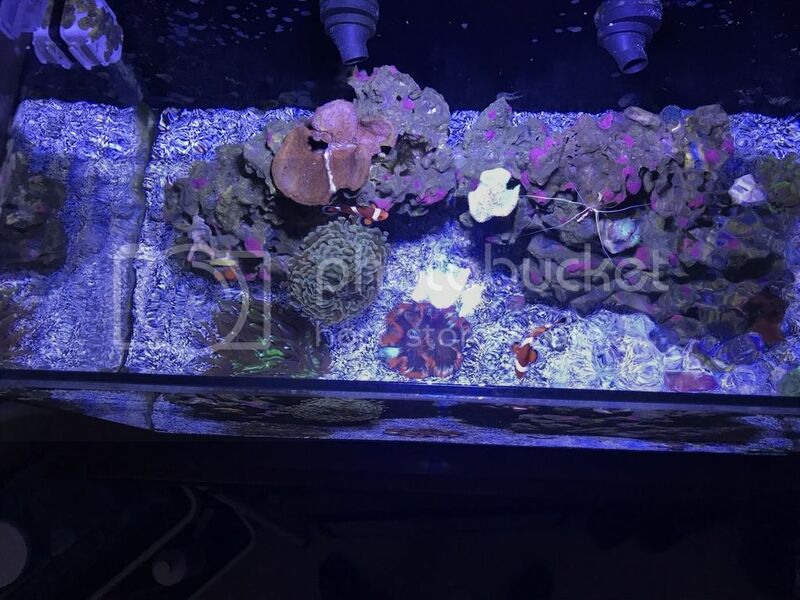 Here is a top down shot of the tank, just to show you some of the colors of the tank. Visited my uncle, who has a 75 gallon tank, this weekend. 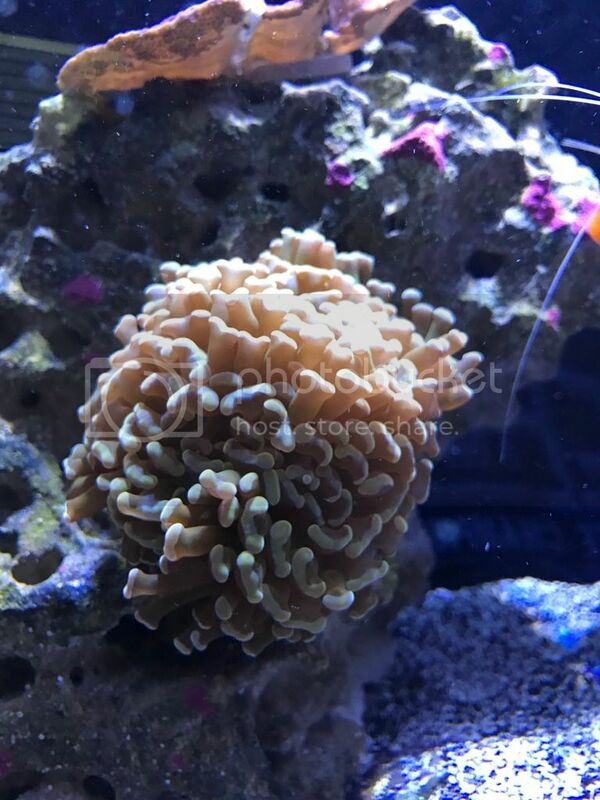 I brought home a cool torch coral, florida recordia mushroom and a finger leather coral. Trying to figure out if I can put one more fish in my tank. 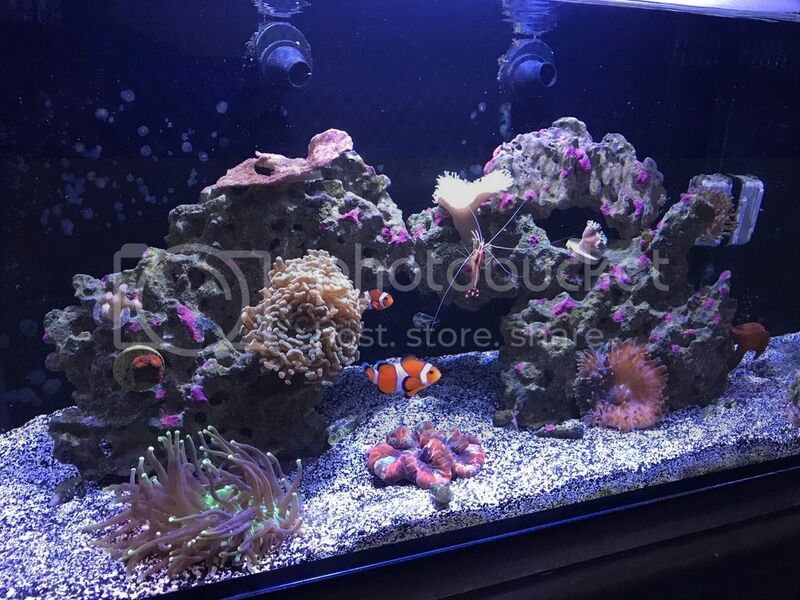 Right now I have two clown fish and a diamond back sand sifting goby. I have a 20 gallon tank and I do a 1 gallon WC twice a week. any thoughts on if I can add another fish and what fish do you guys suggest? I would not add any more fish as a pair of clowns will be very territorial and take over the whole tank. My sand sifting goby's "burrow" is right under the anemone that they host are they maybe not as territorial as normal? thats a nice looking tank you got there! I'd be wary of adding an additional fish. I would love to add a cleaner wrasse to this tank. Awesome set up man! 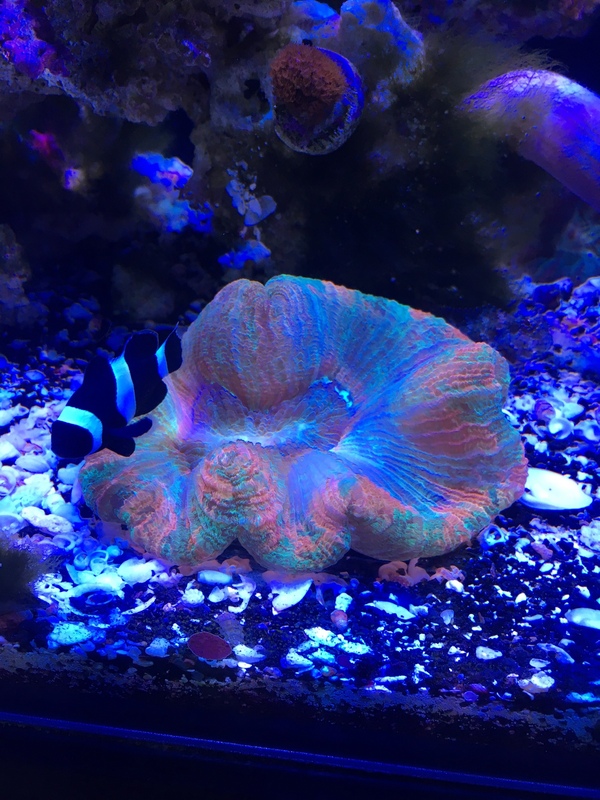 black clownfish is the one thing I would have changed about my tank, or atleast just an exotic pair. Cleaner Wrasses from Redsea, Extra Hardy! I'll have to look into it!! Cleaner wrasses are one of the hardest fish to keep, especially in a tank your size. Hy guys thanks for all the opinions, I went with a starry blenny instead of a cleaner wrasse. He has been in there for 3 days and seems to be doing pretty well. Hey guys, my tank is still up and running. its been awhile since I have last posted but life has been crazy. If I can get around of to it ill post some updated pictures. 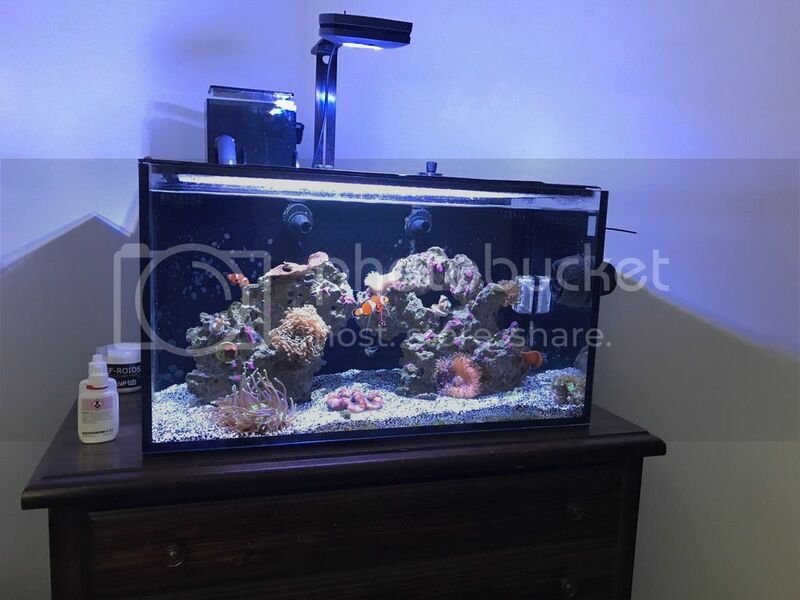 equipment is pretty much the same but corals have changed. I have two AI primes now! The single prime had some shadowing on the sides of my tank. Two of them provides full coverage. I probably wouldn't bite it and buy one radion, I think you would still have shadowing on the sides. a hydra or xr30 would be the premium option but I am more than happy with two AI primes.